Could The Tesla Model 3 Cut Your Car Costs By A Third? I have written a series of articles on this site that attempted to accurately estimate the total cost of ownership (TCO) of various Model 3 trims, and then also compare those TCO estimates to a variety of competing cars. You can read the latest one, comparing the Model 3 to all the mainstream midsize sedans (Camry, Accord, Optima, and Malibu). Today, I thought it would be a fun thought experiment to speculate on how the Model 3 could dramatically cut people’s automotive costs. Could they be cut by a third? Maybe even more? Let’s explore! I’ll describe 3 different comparisons — the Model 3 compared to a BMW 3 Series, a loaded Camry, and a very economical Optima. 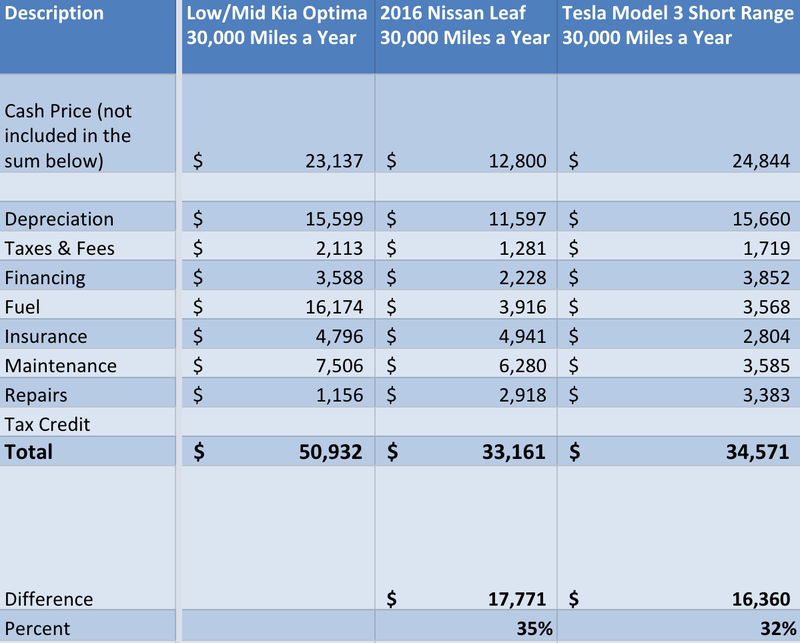 At each stage, I’ll have to make some assumptions to see if the Tesla can not only match the costs but attempt to beat them by 33%. 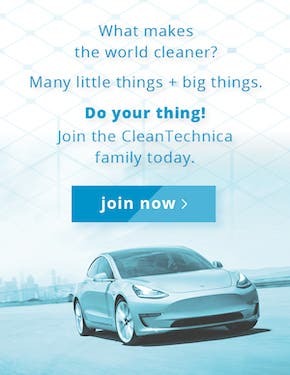 Can the Model 3 do it? Read ahead and see! All of the estimates are for a 5 year period. Additionally, note that the cost cuts noted below only concern after-purchase costs. 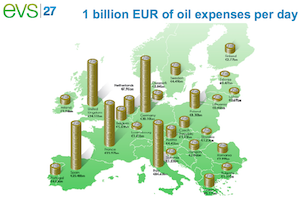 The calculations do not account for the cash purchase price of the cars. 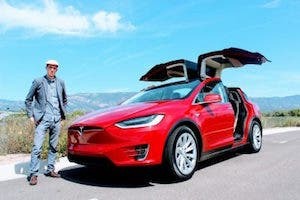 Buying a Tesla is more fun to drive (as many articles have documented), signals that you have “made it” and are an early adopter of hot new technology. Most people don’t also realize they will get significant savings over 5 years for a comparably priced car. As you can see from the chart below, you can save 43% by buying a Model 3 — or if you don’t want to save that much, spend about half the projected savings and get Autopilot and the Performance version! Next up is the comparison to the well equipped Toyota Camry. This is a tougher comparison. We can match the Camry’s costs as I showed in this article, but to beat it by a third, I was going to have to make some different assumptions. First, a big part of the savings in driving an EV is in fuel costs, and you don’t get big fuel savings if you don’t drive a lot of miles, so I doubled the miles driven a year from 15,000 a year to 30,000 a year. 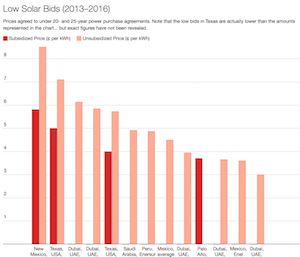 I also made the assumption for this comparison and the next that you signed up for special time of use (TOU) electricity rates with your local utility, cutting your fuel costs an additional 30%. That won’t apply to everyone. I assumed a 30% increase in insurance costs for both cars to account for increased mileage. I doubled the maintenance and repair estimates for both cars to account for the increased mileage. The result is a 32% reduction in costs, almost to the 33% goal! For the last comparison, I wanted to see if we could cut the cost of driving a cheap gas car significantly. I knew I was going to have to use every trick in my financial hat! 1. 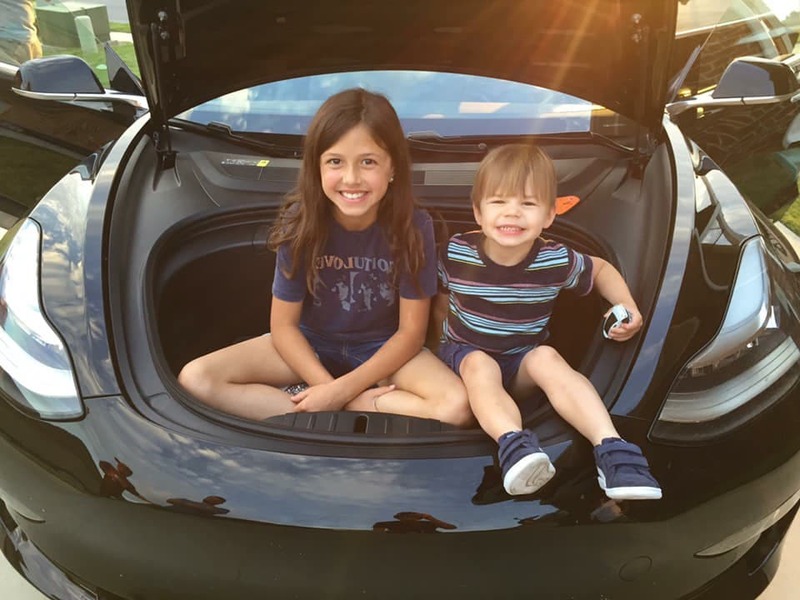 A Tesla feels new even when it isn’t, since it constantly gets new software and the motor and battery are expected to be long lasting and relatively trouble free, so why not look at a 3 year old model? I’m looking into the future, since there are no 3 year old Model 3s available today. This would significantly cut depreciation, taxes, fees, and financing costs, which make up the vast majority of the Model 3’s total cost of ownership. The disadvantage is you will not be eligible for any tax credit for a used vehicle in most places (of course, even new cars might not be eligible in 3 years). Those 5 items (depreciation, taxes, fees, financing, and tax credit) total $28,222 for a Mid Range Model 3 that you would buy today. 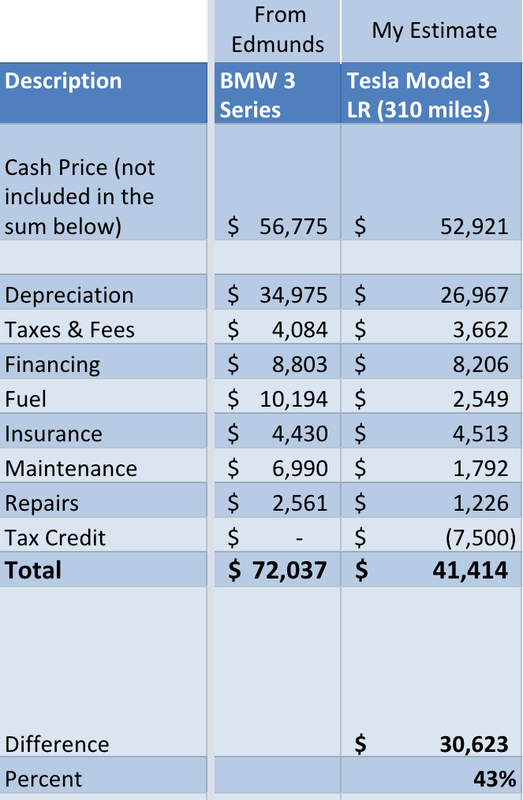 For a 3 year old Standard Range Model 3 that we assume has lost 30% of its value, the 4 items (no tax credit) total $19,561, for a 5 year savings of $8,660! Because you weren’t going to get a car for over 3 years, I thought I better throw in something for you to drive, so I put in a used 2016 Nissan Leaf. 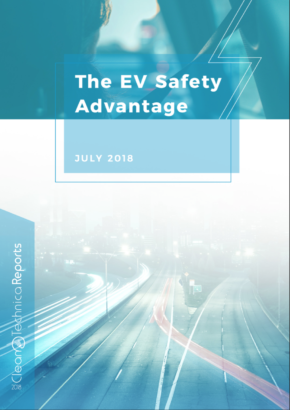 This will be challenging to use in a high mileage situation since driving a lot of miles without a lot of range can cause you to spend some extra time charging on the road and using PlugShare to find Level 3 charging stations. As an alternative, you could keep your existing gas car a few more years. 2. As before, I assumed 30,000 miles of driving for all the cars. For the Nissan Leaf and used Model 3, I took 30% off the rates for the before-mentioned TOU rates. 3. If Autopilot and/or Full Self Driving prove themselves, insurance rates for the cars using them should be reduced. I assumed insurance 30% less for the used Model 3 driving 30,000 miles a year than Model 3 today driving 15,000 a year. That generates $1,709 in savings over 5 years. 4. As before, I doubled the maintenance and repair estimates for all 3 cars to account for the increased mileage. For repair costs, I doubled the Optima to account for the doubled mileage. Since the Leaf repair number is already a higher number from Edmunds for being used, I doubled it also to account for high mileage. For the Model 3, I tripled my estimate for a new Model 3, since my Model 3 estimate is based off a new car where some repairs will be covered under warranty, and of course a new car should have fewer repairs. On the other hand, a used car has those initial issues worked out, so that could be a slight advantage. 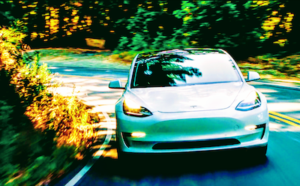 It wasn’t easy, but the Leaf costs ended up being 35% below the Optima’s 5 year cost of ownership and the cost of used Tesla Model 3 ended up being 32% below! I’ll call both of those roughly a third below! To answer the original question, the answers are: yes, almost, and almost (someday). If you want to cut your costs by a third of a comparable luxury car, you can do that today by buying a Tesla Model 3 before year end. 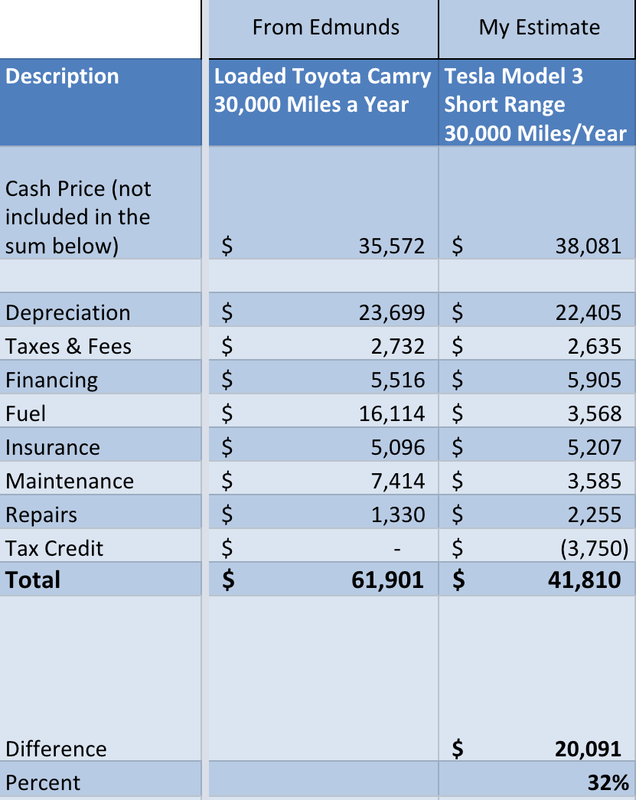 If you want to cut your costs by a third of the TCO of a loaded Camry, you need to drive a lot of miles (approximately double the national average) and wait for the $35,000 car. If you want to cut your costs by a third for a low- to mid-range Optima, you need to use a used Nissan Leaf and buy a used Model 3 in a few years when used standard-range models are more affordable.